A simple veggie side dish that packs a ton of flavor. Just a few simple ingredients that will have your whole family going back for seconds and thirds. One day my amazing friend Denise brought me lunch from one of my favorite restaurants. She brought the salad I requested, but also got me a side of their caramelized cauliflower. It was…life changing. Smothered in tahini sauce and sprinkled with toasted pine nuts, it was kinda the stuff dreams are made of. Of course, now I’m addicted to said cauliflower dish, and I can’t help but order it all.the.time. Then one day I find out its deep fried, and all of the sudden my dreams are crushed. So sad. I was desperate to recreate the dish at home, so I did a little research, got my onions caramelizing, put the cauliflower in the oven on very high heat to get them dark and caramelized, and got to work whipping up my own tahini sauce. I’ve never made tahini sauce before, so I followed a recipe. It was…disgusting. I tried adding and changing things, but it was just hopeless. I pouted a little, tossed my cooked veggies together and grudgingly served them to our company. Ya know that rule about not trying anything knew when you have company? I break it every single time. But wait!!! It gets better!! The dish ended up being totally awesome without the tahini sauce! 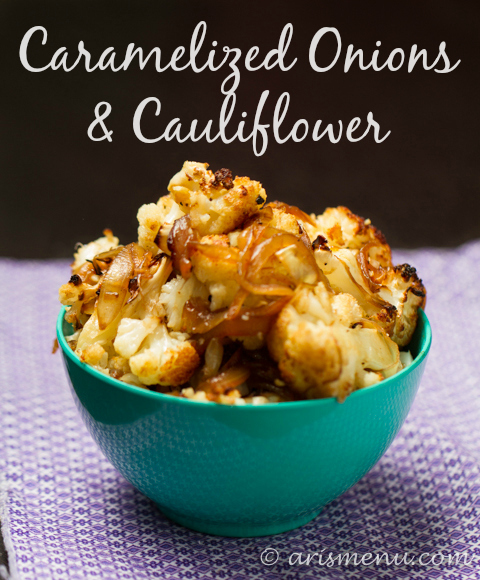 Just basically simple roasted cauliflower and caramelized onions thrown together–who knew it would be like magic? By roasting the cauliflower at such a high temperature, it gives it a bold flavor, and great crispy texture while maintaining a soft (but not mushy) inside. I know it can be tough to plan to get all of our veggies, and I totally get into a rut and just throw a bag of kale from TJ’s in the oven most nights because I don’t feel like being creative, but it doesn’t take long to put something a little nicer together, and it really makes a big difference when it comes to loading up your plate with the good stuff! Preheat oven to 500. Place cauliflower in a large baking dish. Drizzle with olive oil and season with salt and pepper. Bake browned and crispy, tossing 1-2 times during cooking, about 45 minutes. Meanwhile, move on to the onions. Heat olive oil in a large pan over medium-low heat. Add onions and balsamic vinegar. Season with salt and pepper. Cook until soft and caramelized, about 30-40 minutes, stirring often. 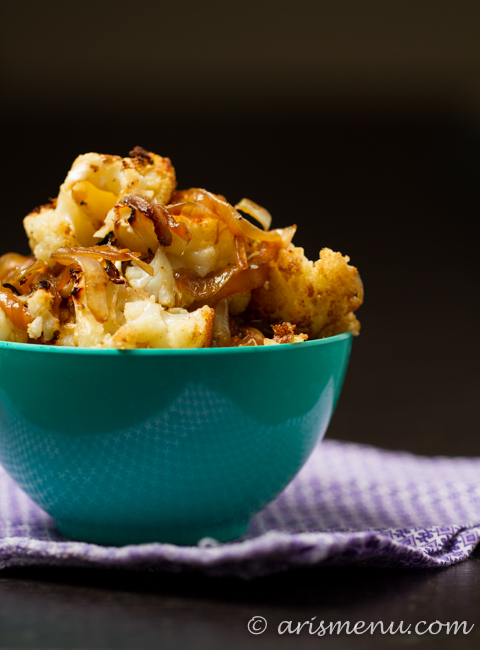 Lightly toss cooked cauliflower and onions together and serve immediately. Just reading about that restaurant cauliflower dish makes me want to try it, but boo on the deep fried veg. 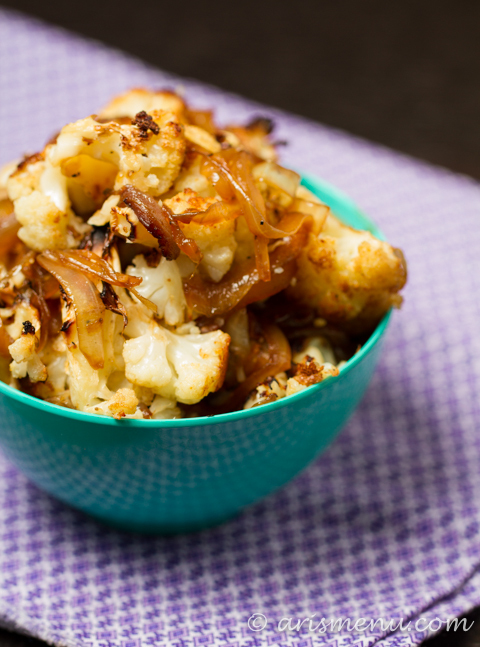 This looks perfect- I really love roasted cauliflower. It’s a “healthy” restaurant too! I couldn’t believe they deep fried it! This was definitely a good replacement. 🙂 Thanks Melanie! Seconds and thirds for me, please! I. am. drooling. onto. my. keyboard. I need this now!! Pinned. Caramelized onions or leeks are amazing. Another winner! I’ve never had caramelized leeks! Although, pretty much put the word “caramelized” in front of just about anything and I’m game! i love caramelized onions! must try the cauliflower! I could seriously eat this for breakfast right now… mmmm! Happy Thanksgiving, Ari! Haha I used to eat a huge bowl of veggies for breakfast every morning! I’m a total weirdo, but I seriously love it. I hope you had a great holiday weekend Laura! Looks fab! Now if only I could digest cauliflower! What??? What a bummer! Try the onions with some seared brussels sprouts–that would also be delicious! I love the simplicity of this! 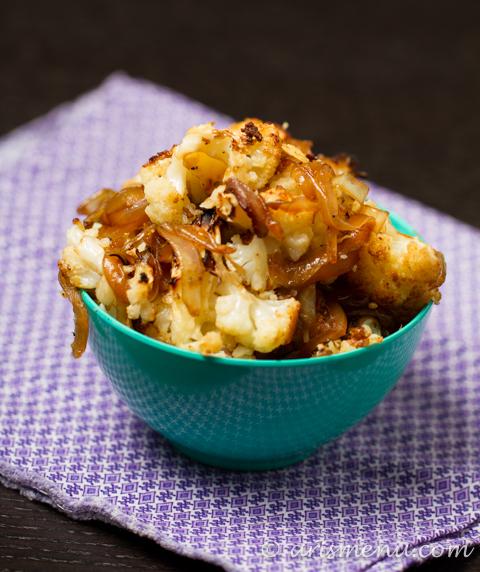 Cauliflower is one of my favorite veggies! I’m actually not usually a fan–it has to be done a very certain way, but when it is, I’ve learned I really do love it! NOW THIS is right up my ALLEY!!! 😀 A recipe GiGi can eat!! Yeaaaahhhh girl! I actually make a ton of veggies, but I don’t usually follow any sort of recipe, so most of them never make it to the blog. There’s only so many times people can see the same kale chips, haha. OMG two of my favorite things! MM, looks good! One of our friends makes buffalo cauliflower and sesame cauliflower it is really good! Okay now those sound AWESOME! I have never roasted cauliflower! I’m so behind the times! Hah, this was my first time! I really thought I hated it, but if you cook it enough, it actually begins to taste good…really good! Just don’t make it into a pizza crust. Ew. This sounds amazing! 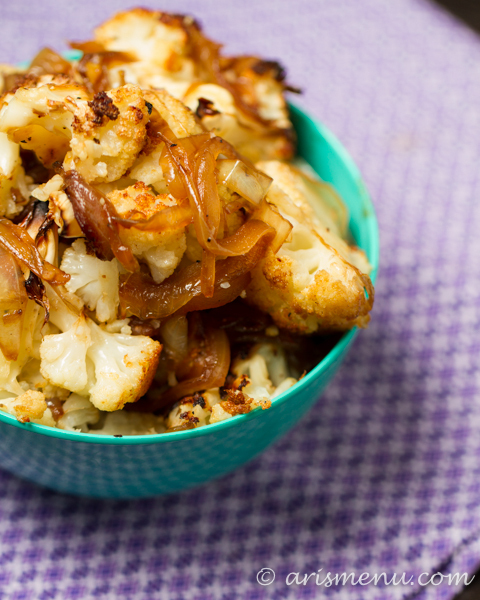 I’m a sucker for roasted cauliflower, and caramelized onions (AND Pita Jungle!) so it’s like this dish was meant for me. Totally pinning! P.S. The only time I’ve ever deep-fried cauliflower was when I was pregnant and justified it that what…and it was ah-mazing. But my general rules is that veggies should be at least moderately healthy. But next pregnancy…look out! Hahaha that is a great rule! I’ve never deep fried anything myself because I am too worried that the next thing I know I will want to deep fry EV-ER-Y-THING. PS when you said you loved Pita Jungle I freaked out and thought maybe you lived in AZ and we could become real life best friends. But then I stalked your blog and remembered they were expanding. Ummm, I promise I’m not a creeper, haha.